Elegant and Grunge, not something that you'd automatically put together. But I think it works here, what do you think? Coastal Cabana card base, and Coastal Cabana and Crushed Curry stamped with Gorgeous Grunge on the Whisper White background. 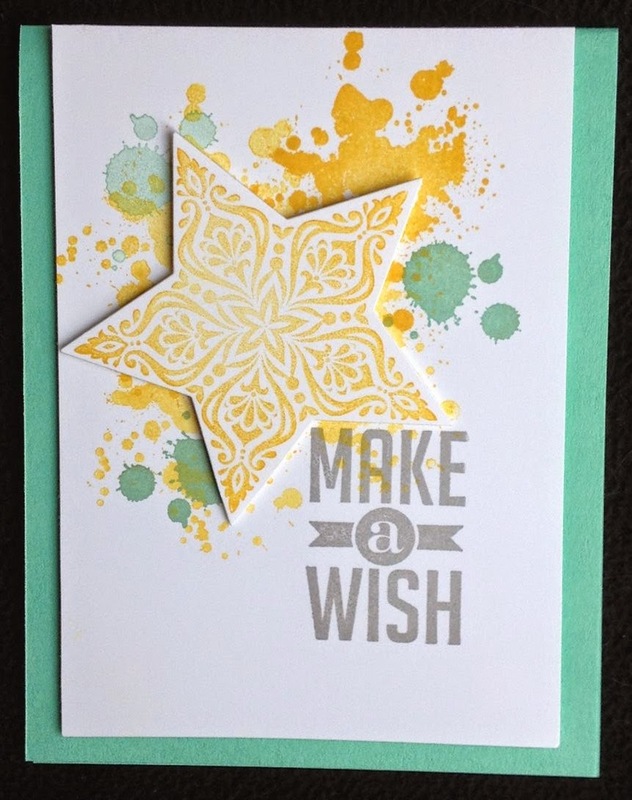 The Bright & Beautiful star is stamped (stamp off first) in Crushed Curry and Die cut with the Stars Framelits. Perfect Pennants provides the matching sentiment, stamped in Smokey Slate. The star and the white layer are both popped up with Stampin' Dimensionals. I like this sentiment because it could be a birthday card, or a New Years card, an encouragement card, or a wedding card (a dream is a wish your heart makes, finding your prince charming...) A few different options... Change up the sentiment to the Christmas ones in the Bright and Beautiful set and it could work for Christmas... A pretty versatile layout -- I used it in the Autumn Accents cards too! Die Cut, background two tone inks, and sentiment!